Week 2 of our summer of promotion highlights two very funny women: Molly Stevens and Dorothy Rosby. 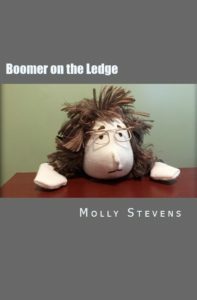 In our first blog post of the week, we are re-visitng the interview HO did with Molly Stevens author of Boomer on the Ledge. Follow Molly and Boomer on the Ledge on Facebook and Twitter. HOPress-Shorehouse Books is so excited and proud to bring readers everywhere our newest author Molly Stevens and her first book Boomer on the Ledge™ This pictorial book is available in paperback and eBook format and we are sure that it will not only make your laugh but if you are a Boomer or know a Boomer, it will take the grim out of going gray. Today, we are giving you a glimpse into the world of Molly Stevens. Please check out her website ShallowReflections.com for news on how you can also purchase a custom-made BOTL doll which by the way, looks an awful lot like Molly . I was born in northern Maine, raised on a potato farm, youngest of four and was very attached to my mother. So according to my siblings, I was spoiled, but of course, they were wrong. I’ve always been an avid reader and dabbled in writing intermittently. 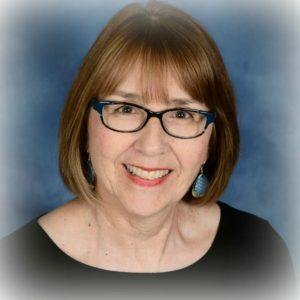 I started writing humorous posts on FaceBook, and friends and family urged me to start a blog. So in 2015, I started my blog, Shallow Reflections, and it ignited a newfound passion. What has your publishing experience entailed? This is my first book, though These Summer Months, Stories from, The Late Orphan Project edited by Anne Born, included an essay I wrote about my mother and was nominated for the 2017 International Book Awards. How did you come up with the concept of Boomer on the Ledge™(BOTL)? I watched my grandsons get excited about finding an elf posed each morning leading up to Christmas and thought my generation was missing something fun. My mother left me a little vintage doll I started photographing in different poses, and it cracked me up. I brainstormed ideas with my husband, Patrick, and The Boomer on the Ledge™ concept was born. I waited for a year before I published it as a blog post, then decided I needed to expand it into a book with a new doll. 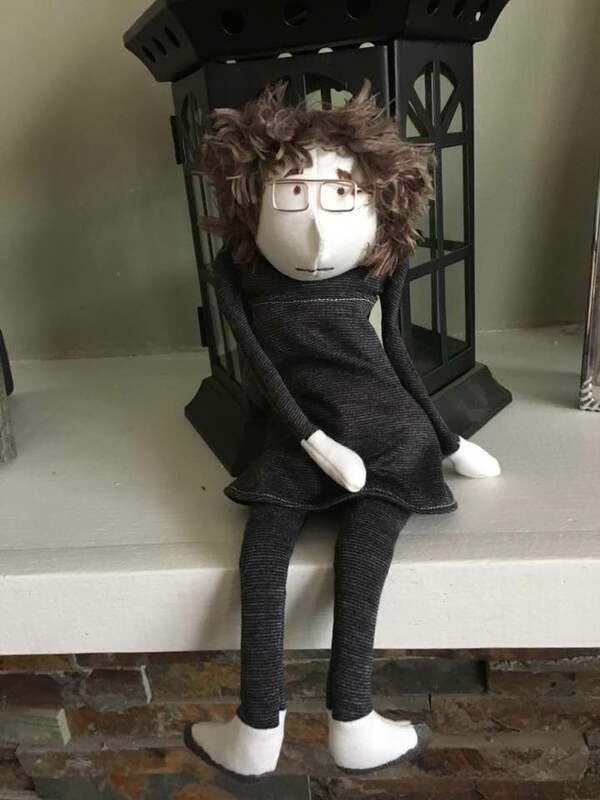 I designed my vision of the doll, and worked with a fantastic seamstress, Brenda DeRoche, to make the doll come to life with a unique personality. The more we worked on the design, the more she looked like me, especially when I first get up in the morning. What made you decide to make it a pictorial project? What made you decide to make the doll come to life? I enjoy the creativity of using pictures to enhance my writing and have written quite a few photo essays. This work was my ultimate photo essay project. I love how relatable the doll and her antics are to people my age, and how she makes me laugh. My mission is to help people see the humor in all of life’s situations, and this book helps me achieve that for the boomer generation. What was most challenging about doing the book? I shot the pictures during the height of summer, and in Maine, that means endless hours of bright sunlight. I used an umbrella, a blanket and even did a few photos in the bathroom with the shade pulled to get the proper lighting. What do you like most about being a boomer? I like the freedom to shed pretenses and be myself, allowing me to express my creativity without inhibition. Do you wish you were young again? I guess the most decisive answer I can give to this question is ‘yes’ and ‘no,’ but mostly ‘no.’ Do I miss the days when my skin had elasticity, and I had a defined waistline? Yes. Would I go back and What do you hope your readers get from this book? I hope my readers laugh out loud, and want more from The Boomer on the Ledge™ because I have a feeling she will have future appearances, showing boomers how hilarious aging can be.